No doubt, the former Commies at Pravda are having a field day with President Bush. They read the liberal media here in the US, drink a few gallons of vodka and are off to the races. Every week they provide me with more entertainment than all of Hollywood put together. What is amazing is the similarity between the Commies at Pravda and the Commmies at the New York Times. They practically echo each other. Hmmmm. There may be something there. What if the two Commie groups are one and the same? 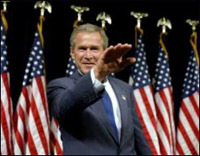 Will George W. Bush Surpass Hitler? George W. Bush was not elected president of the USA, in the year 2000, by the majority of US-voters. He was elected with one vote of a so called Supreme Court of the USA with the vote of one single judge, put in charge byGeorge Bush I, father of the later. A court that functions like a right-wing think tank is as useless for a nation as a kettle with a big whole in the bottom for a household…. But the destiny was friendly with the most stupid politician of the world ever… Provoked by a supremacist state that advanced always the interest of Israel over the rest of the whole Arab region and the Palestinians in special, some eager minorities in Arabia decided to shorten two towers in New York. Not a good idea, but very efficient, just as efficient as the biggest US-companies, when they decided to shorten the chances of people living in poor areas of the world. Comparable to the tumbling down of a rotten regime opening all chances to Hitler, the tumbling down of towers opened George W. Bush all opportunities he wished to have and that the one judge in Washington alone could not guarantee him…. Now he found good reasons for a war in Afghanistan, some other in Iraq and some possible future war against Iran, whose population was however already shortened with the assistance of the USA in Saddam Hussein’s gas war some years earlier. When his army entered Afghanistan, they found some crazy chaps that were not destructing three million Vietnamese but studying terrorism against the ones who see capitalism, neo-liberalism and new-borness as the one real thing on Earth. Unfortunately, many of the people brought to Guantanamo proved to be rather marginal terrorists or even totally innocent. But George W. changed the whole USA in a McCarthy-camp, terrorised his own population and violated all international human rights and courts laws. And Russia, who gave away the whole wealth of Ex-Soviet-Union to a handful of oligarchs, China gave away all chances for developing a reasonable program to cure the situation of its population, especially of the peasants on the country-side, and favoured instead a funny mass-Milton-Friedman-capitalism, and Europe continued to dream its dreams for growth, to the disadvantage of all future generations, all these nations just looked over the two oceans and applauded George for his heavy-metal Hollywood-behaviour. It is easier not to interfere, if the own limits of growth, feasibility and financing bubbles by debts will prove to have been rather unrealistic. No doubt, Adolf Hitler was a bad, bad guy, indeed. Let’s face it: The nation of culture of the Germans made him dictator by democratic votes, exactly like George, and they accepted all crimes against Jews, and many must have known about the “Wannsee-Konferenz”. Without the help of millions of Nazi-Germans, never six million Jews and about hundred million Russians, Poles, Americans, English, French and other nationals could have been killed or tortured to death. Here we have some parallels with Pinochet’s and Videla’s torturing to death of its youth and their final killing, assisted by later USA and its CIA and even worse the extermination of some three million Vietnamese for capitalistic ideology and many other nationals being killed since 1950 to this very day for the same purpose - with the assistance of CIA and some other crazy conspirators and blood dictators. 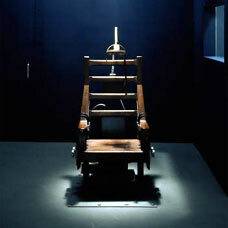 But Bush has not only invested in Guantanamo, this heroic monument for the criminal energy of the US-politicians since 50 years, no, he has in addition made explode the state indebtedness of his country that will make tumble down stock exchanges, banks and old age insurance, he has made explode the hatred of most of the countries throughout the world against the USA, the best loved nation after WW II, he has convinced that a terrifying war against environment with a stupid growth and the exposure of billions of tons of poison spread out by huge cars, planes, power stations etc., helping therewith the future generations to “survive”, and with the neo-liberal theory of Friedman and Greenspan he helped to enrich his greatest US-Companies and, at the same time, to destroy all hopes of the weaker states in South America, Africa and Asia. Final conclusion: George W. Bush has put a time-bomb in the world that could kill in the long run billions of human beings from now on. Has anyone opened the question if Napoleon, Hitler, Stalin, Mao, Putin, Blair, Chirac or George W. Bush are to be recognized the greatest criminal figures of all times? The historians of the year 2100 will know. On the same day that our enemy in the war on terror dumps the tortured, mutilated bodies of two US soldiers in a ditch in Iraq and scurries off to hide under their rocks, the ACLU steps out and accuses the US or torture, abuse and violation of human rights. There are days like this that make me wish I were a bomb-throwing anarchist with a closet full of molotov cocktails. If I were I’d have blown the ACLU’s headquarters to hell and gone by now. What kind of group hides in a free country with all the human rights available to them and the freedom to do whatever they please and spends its time attacking the very insitution that allows them to be free? This is the same organization that seemingly does not care at all about mutiliated, beheaded terrorist captives or the bloody suicide bombers who have murdered innocent women and children in Iraq. NEW YORK—The American Civil Liberties Union today released a report to the U.N. Human Rights Committee condemning the U.S. government for failing to comply with its treaty obligations to protect and preserve a range of human rights protections at home and abroad. Drawing attention to some of the most vulnerable members of society, including women, children, minorities, immigrants and the accused, the ACLU offered detailed recommendations to bring the U.S. in line with universally recognized human rights standards. “America should be a beacon of freedom throughout the world, not a country that violates the basic human rights of its own people,” said Ann Beeson, Associate Legal Director of the ACLU. The report, Dimming the Beacon of Freedom: U.S. Violations of the International Covenant on Civil and Political Rights, documents the U.S. record on human rights in five areas: national security, women’s rights, racial justice, immigrants rights and religious freedom. The Human Rights Committee is the U.N. body of experts charged with monitoring countries compliance with the International Covenant on Civil and Political Rights (ICCPR), the primary human rights treaty. The United States ratified the treaty in 1992. The committee will review the official submission of the U.S. government on July 17 and 18 in Geneva. The ACLU will send a delegation to present the report and monitor the proceedings. Dimming the Beacon of Freedom provides a detailed description of human rights violations in the United States. In addition to the impact of these rights violations on other vulnerable groups in the U.S., the report highlights how in the wake on September 11, 2001, Arabs, Muslims and South Asians, and to some extent all immigrants, were victims of discriminatory targeting by the government. It draws attention to the erosion of the right to privacy, discussing expanded surveillance and the government’s growing use of the states secret privilege to avoid accountability for abuses. Kim Jung Il is one sick, insane madman. He is racheting up the saber-rattling another notch with a new missile that is capable of reaching the US. Japan is worried and has already issued a warning about any missile overflight. The NOKO’s also reportedly have nukes. It’s enough to make you tear your hair out. WASHINGTON — North Korea appears to have completed fueling a long-range ballistic missile, American officials said Sunday, a move that greatly increases the probability that it will go ahead with its first important test launching in eight years. A senior American official said that intelligence from satellite photographs suggested that booster rockets had been loaded onto a launching pad, and liquid-fuel tanks fitted to a missile at a site on North Korea’s remote east coast. While there have been steady reports in recent days about preparations for a test, fueling is regarded as a critical step as well as a probable bellwether of North Korea’s intentions. Siphoning the liquid fuel out of a missile is a complex undertaking. “Yes, looks like all systems are ‘go’ and fueling appears to be done,” said the official who discussed the matter only after being promised anonymity because he was addressing delicate diplomatic and intelligence issues. A second senior official, who declined to speak on the record for similar reasons, also indicated that the United States believed the missile had been fueled. A launching would be a milestone in the North’s missile capacity and effectively scrap a moratorium on such tests declared by the North Koreans after their last test in 1998. Moreover, a launching would have enormous importance for American security because it would be North Korea’s first flight test of a new long-range missile that might eventually have the capacity to strike the United States. PYONGYANG—North Korea yesterday threatened to “mercilessly wipe out” US forces in case of war during a national meeting to mark leader Kim Jong-Il’s 42 years’ work at the ruling party. The threat, in a ruling party report carried by the Korean Central News Agency (KCNA), came as North Korea was reportedly preparing to test-fire a long-range missile despite strong protests from the United States and its allies. Choe Thae Bok, a ranking Workers’ Party official, said Washington was “hell-bent on provocations of war of aggression” in the report to mark the 42nd anniversary of Kim’s start at the party, KCNA said. “If the enemies ignite a war eventually, the Korean army and people will mercilessly wipe out the aggressors and give vent to the deep-rooted grudge of the nation,” Choe was quoted as telling the meeting. South Korea, which seeks to reconcile with N Korea after decades of hostility since the 1950-1953 Korean War, has urged Pyongyang to abandon any plans to test-fire the missile. But South Korea maintained its usual level of military alert yesterday despite the news reports about an imminent missile test launch. “The military is on the same level of alert as usual. There has been no upgrade in the military alert yet,” a defence ministry spokesman said. Welcome to the “CommiSphere” - formerly known as South America. What Leon Trotsky and Che Guevara couldn’t succeed at is today being brought to fruition in that large chunk of land to the South of us. Old Fidel is getting long in the tooth and won’t be among us much longer (hopefully) but he has two new disciples in Venezuela and Bolivia. The really strange part of this story is that Bolivia is where Che Guevara met his demise at the hands of the Bolivian Army in 1967. You may recognize Che’s picture. The Liberals and Leftist asshats in America adore him and his hairy puss adorns millions of their t-shirts. A commie thug, no less. Nowadays it seems the new President of Bolivia, having nationalized all the country’s energy resources (read: stole from foreign investors) is absolutely in love with Commie Che. Between the drug lords and the Castro puppets, South America is going to the dogs real fast. Don’t people ever learn? Communism failed miserably, Castro has literally enslaved millions of Cubans and revolutions never change anything - except who is on top ... the misery remains the same - especially in the CommieSphere. LA HIGUERA, Bolivia (Reuters) - Bolivian President Evo Morales pledged solidarity with Cuba and Venezuela on Wednesday as he paid homage to Ernesto “Che” Guevara at the spot where the legendary leftist guerrilla was killed in 1967. Clutching double-sided Cuban-Bolivian flags, white-coated Cuban doctors joined Morales and hundreds of local residents in the remote eastern village La Higuera to mark the 78th anniversary of the Cuban revolutionary leader’s birth. Morales, who has hung a large portrait of Guevara in the presidential palace, defended his leftist alliance with Cuba and Venezuela and said he would be willing to take up arms to defend them in the face of any U.S. attack. “If they did it in Cuba, in Venezuela or Bolivia, we’d be willing to take them on with arms to defend the nation, natural resources and social reforms,” Morales said. Morales has formed close ties with Cuban President Fidel Castro and fellow leftist Chavez since being elected six months ago on pledges to increase state control of natural resources and fight poverty in South America’s poorest country. 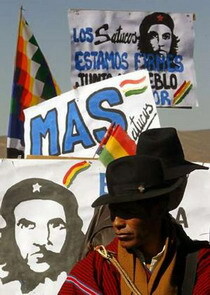 He is the first Bolivian president to pay homage to Guevara in the mountainous area where the Argentine-born medical doctor was captured and shot to death by Bolivian soldiers as he sought to spread communism to Bolivia. Guevara was Fidel Castro’s lieutenant in the 1959 Cuban Revolution. His attempt to spark another movement in Bolivia in 1967 was stopped after seven months of fighting in the subtropics. He was captured on October 8 and taken to the school building in La Higuera, where he was executed the next day at the age of 39. Finishing off his speech in La Higuera, Morales shouted “Viva Cuba! Glory to Che!” before Cuban doctors took the stage to sing “Happy Birthday” to Guevara around an enormous birthday cake bearing 78 red candles. Les Fwench Commies are outraged that their Russian counterparts discriminate against Les Pacquiers du Fudge. They claim the Russkis have “betrayed the ideals of Marxism.” Sacre Blew! Some stories just seem to write themselves. The world communist movement is currently facing a major scandal. The relations between the Russian and the French communist parties have been practically ruined. The reason of the conflict lies in the negative attitude which the leader of the Russian communists, Gennady Zyuganov, expressed against the recent gay pride parade in Moscow. 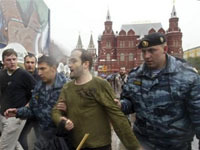 The outcome of the “free love parade” in Moscow is history now. Young communists and patriots violently attacked the homosexuals and defamed them. Delegates of the French Communist Party, who took part in all events organized by the Moscow gay movement, did not hesitate to express their reaction to that. The French communists harshly reproached their Russian colleagues of being homophobic and betraying the Marxism-Leninism ideology. The Socialistic Party of France (the country’s second largest party) supported the communists of France too. Unlike for the Communist Party of the Russian Federation, the struggle for social justice implies the protection of class interests, as well as people’s rights and freedoms, including the right to choose a sexual orientation. That is why the French communists described the Russian Communist Party as a homophobic and anti-communist organization. A member of the political bureau of the French communist organization Richard Sanchez said that they simply could not make up with such an idea. “It is nonsense for European communists. Being a communist and a homophobe at the same time is so typical of the Communist Party of Russia,” said he. Another spokesman for the French communist party said that the CPRF was a non-communist party, which still had the communist rhetoric, but betrayed the ideals of Marxism. “The French comrades” also criticized Russia’s communists for their aspiration to form the real opposition in Russia. “The Russian Communist Party has actually been the government of the country for almost 80 years. Therefore, they simply do not know what it means to be a real opposition. They think of themselves as the opposition, but they do nothing that an opposition organization would do. It’s all about declarations, that’s all,” Sanchez said. Richard Sanchez thinks that Russia needs to have the real leftist movement, but not the CPRF which views itself as an opposition organization. BUCHAREST, Romania (AP)—More than 60 years after it was seized by communists, the Romanian government is to hand back one of the country’s most popular tourist sites, the fabled Dracula Castle, to its former owner, the culture minister said Tuesday. The castle, worth an estimated $25 million, was owned by the late Queen Marie and bequeathed to her daughter Princess Ileana in 1938. It was confiscated by communists in 1948 and fell into disrepair. It will be transferred on Friday to Dominic van Hapsburg, a New York architect who inherited the castle from Princess Ileana decades after the communists seized it, minister Adrian Iorgulescu told a news conference. Van Hapsburg is a descendant of the Hapsburg dynasty which ruled Romania for a period starting in the late 17th century. The hand-over ceremony will take place Friday at noon in the 14th century castle’s museum deep within the fortress in Transylvania, Iorgulescu said. Restoration work began in the late 1980s and was partially completed in 1993. It is now one of Romania’s top tourist destinations. Under the agreement, the owner will not be allowed to make any changes to the castle for the next three years, Iorgulescu said. While known and marketed as “Dracula’s Castle,” it never belonged to Prince Vlad the Impaler, who inspired Bram Stoker’s Count Dracula character. But the prince is thought to have visited the medieval fortress. 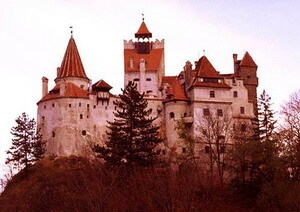 The Gothic fortress, perched on a rock, has appeared in numerous Dracula movies. At the gates of Bran Castle, peasants sell Dracula sweaters hand-knitted from the thick wool of local sheep, cheesecloth blouses, and Vampire wine. The castle is the most famous of 15 citadels and fortresses in the area, which were built by peasants to keep out marauding armies of Turks and Tartars and cruel local medieval lords. Another former royal property, the Peles Castle, built in the late 19th century in the mountain town of Sinaia, will be returned to former King Michael. He owned it before it was confiscated by the communist regime in 1948. Romania passed legislation earlier this year to return property to its former owners and establish a “property fund” to pay damages for assets that cannot be returned. The fund includes stock in state-owned companies that are being privatized. Socialism is the only way to thwart barbarism and bring the humankind to a turning point in its fateful history, said Venezuelan President Hugo Chavez in London, Sunday, May 14. Chavez spoke during an encounter with British personalities and groups who support the Venezuelan government. The meeting was held in the Camden Center in North London, reported Prensa Latina news agency. “Let’s take on socialism; let’s debate it and build it. I believe that its mistakes were in the economic analysis, there should be social praxis, and 21st century socialism should be based on solid human values,” he stressed. “We are facing the threat of global challenges stemming from the genocidal, immoral, sick, and corrupt elite currently governing the United States, which appear to have no limits,” he added. The Venezuelan president warned about Washington’s threats against Iran and he said that if that aggression materializes, oil prices could reach 100 dollars a barrel. “The outcome of such aggression is unknown, but the Empire is going to find itself inPa worse position than the one they have currently in Iraq, where they do not know what to do with the civil war that has erupted there and can’t find a way out,” he noted. Chavez called US President George W. Bush a murderer, guilty of genocide, who supposedly fights terrorism, while his country is a sanctuary of terrorists. Venezuela is considering selling its fleet of U.S.-made F-16 fighter jets to another country, perhaps Iran, in response to a U.S. ban on arms sales to President Hugo Chavez’s government, a military official said Tuesday. Gen. Alberto Muller, a senior adviser to Chavez, told The Associated Press he had recommended to the defense minister that Venezuela consider selling the 21 jets to another country. Muller said he thought it was worthwhile to consider “the feasibility of a negotiation with Iran for the sale of those planes.” Even before the U.S. announced the ban on arms sales Monday, Washington had stopped selling Venezuela sensitive upgrades for the F- 16s. Chavez has previously warned he could share the U.S. jets with Cuba if Washington does not supply parts for the planes. He also has said he may look into buying fighter jets from Russia or China instead. Venezuelan President Hugo Chavez, whose socialist course has won him few friends in Washington, will visit Tripoli on Tuesday for talks with the Libyan leader who once bore the brunt of U.S. disapproval. Libyan leader Moammar Gadhafi has in recent years toned down his fiery anti-American rhetoric and opened Libya’s industry to Western investment. The U.S. announced Monday that it plans to restore normal diplomatic relations with Libya. Libya, like Venezuela, is a major oil producer. Chavez, a self-styled socialist revolutionary, has led a campaign to tighten state control over the energy sector. Libyan officials said Chavez would arrive in Tripoli after a visit to Algeria, a close ally and fellow OPEC member. Chavez will meet with Algerian President Abdelaziz Bouteflika on Tuesday morning before heading to Libya, they said. Analysts said the Libyan talks were likely to focus on energy industry knowledge sharing but that, with oil producers pumping as much as they can and oil prices near records, collaboration on output quotas was unlikely to top the agenda. The ex-mistress of Venezuela’s dictator, Hugo Chavez, has a word of caution about her former lover—beware! Speaking fondly of the would-be Fidel Castro clone and darling of the Hollywood liberal community as a tender lover, Herma Marksman, Chavez’s mistress for 10 years, also told the Times of London that Chavez is dangerous and not to be trusted. For almost a decade in the 1980s and 1990s, Marksman recalls encouraging her lover, then an army officer who used her home to plot a coup against Venezuela’s civilian government. The couple shared a dream, she said, of “a prosperous Venezuela where justice would reign.” That dream, for her at least, is shattered. “Now you can’t trust him,” she told the newspaper. Hmmm. Would this be similar to the 20 million Russians that Stalin murdered? A small number of Cubans have embraced Islam, gathering for prayers and attending religious events mostly sponsored by Iranian diplomats in Havana, one of the converts says. Some Havana residents place the total number of converts at 300; others, at 3,000. What’s certain is that about 70 usually attend the gatherings hosted by the Iranian diplomats. ‘’We are a small community that struggles on. . . . Many people associate Muslims with a not-very moderate Islam, but we are very moderate,’’ said Alí Nicolás Cossío, a former foreign ministry official who now reports for the Voice of Islam, the official Iranian radio station. ‘The community owes much to the embassies’ moral and human support, and the Iranian Embassy—the only Shiite mission—stands out in that regard,’’ Cossío told El Nuevo Herald in a telephone interview from his home in Havana. There are about 16 Arab diplomatic missions in Havana, Cossío said, but the Iranian embassy plays the leading role in contacts with the local Muslims. What do Jimmy Carter, Dan Rather and Louis Farrakhan have in common? A deep and abiding love for Fidel Castro and communist oppression. All three carefully ignore the Cuban prisons full of political dissidents and the virtual police state that Castro runs. Farrakhan also proves how stupid he is by going to Cuba to learn how to survive a hurricane, claiming Cuba has not lost any lives to hurricanes. He conveniently ignores the 16 killed in Cuba by Hurricane Dennis in 2005 or the 1,000+ Cubans killed by Hurricane Flora in 1963 or the Hurricane Of Santa Cruz in 1932 that killed over 3,000 Cubans. Nation of Islam leader Louis Farrakhan is visiting communist Cuba to learn about disaster relief, a visit prompted by the failure of the U.S. government to cope with Hurricane Katrina, he said on Monday. The controversial Nation of Islam leader, who is visiting Cuba for a week, criticized Washington for refusing a Cuban offer to send doctors after Katrina devastated New Orleans last August, flooding neighborhoods mainly populated by blacks and the impoverished. “After Hurricane Katrina and the failure of federal and state government, we felt it was our duty to come to Cuba to learn disaster management from the Cuban people who have had many hurricanes and have not lost lives,” he said.